Introducing the essential companion for dental imaging success! Dental Radiography: A Workbook and Laboratory Manual is a concise, comprehensive solution for both dental assisting and dental hygiene students. 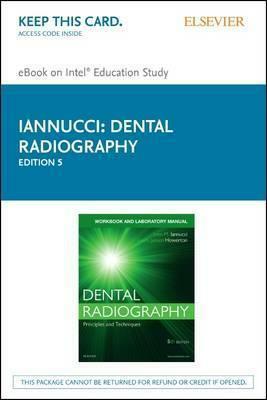 Joen Iannucci and Laura Jansen Howerton have written this exciting new resource as the perfect companion to the bestselling Dental Radiography: Principles and Techniques text. This unique hybrid product is organized into two distinct sections - (1) a student workbook with review questions and activities that reinforce core knowledge and (2) a laboratory manual with step-by-step instructions and competency evaluations for essential hands-on skills.. Combined with the bestselling textbook, the content review exercises and laboratory procedures help you link theory and technique to promote the mastery of clinical skills necessary for professional practice success.